E-mail marketing methods are some of the emails and high-efficiency marketing methods that are often used by many enterprises. What matters in email list building strategies is, to reach the right audience with the right words and visuals. If the company which wants to do e-mail marketing does not already have an active user list or is in need of expanding it, there are a few ways to achieve this. How to build an email list for marketing? Sending incessant e-mails to a randomly chosen audience means doing marketing to people who aren’t interested in product or services provided in that mobile app. However, steps taken after thinking about them can help you with forming a productive mailing list. So, how the enterprises owning a mobile app can form mailing lists? Users may be asked to create an account to enjoy the services provided by the mobile app. Through this membership, not only the possible security issues may be reduced, but it can also be possible to get a list of people interested in the services the app provides. This way, it is possible to send emails and push notifications to members whose contact information was received during the membership process. Users who may want to put comments under blog of a company that owns a mobile app may be asked to enter some of their contact information to do it. 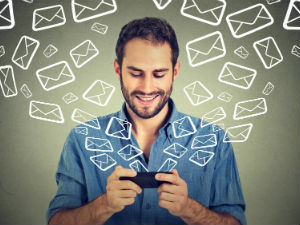 This way, some idea of the user’s interests may be learned, and necessary contact information for sending them e-mails would be saved to a database. Landing pages are places where the internet users who are open to learning about something come to. A mobile app can reach potential user’s e-mail address through search engine ads they will publish relevant to its content. With users providing their email voluntarily, a situation of unwanted emails would be avoided. Putting some effort into the email list building strategies for e-mail marketing is a good idea for keeping the mobile users up to date and for increasing their levels of interest in the app. Creating subscription lists that consist of people who are interested, is a common way to achieve this. And to create a subscription list, you need to have a mobile app that focuses on the user experience. If you want to reach your target audience as fast as possible, create your MobiRoller account now, and create your mobile app without delay.